I've been helping folks migrate from Windows to Mac/Linux. I could go on and on about the storys but I think the best is when one client was able to open an MSWord document in Writer then instantly convert to PDF without the need for any Adobe product. His response to the demonstration was: "Holy sh--, you just saved me $600 per workstation"
What a great project Solveig. I switched to openoffice.org 2 years ago and then to Linux 1 year ago. I'd be happy to tell that story. I'll contact you in the new year. When I bought my wife a new computer 2 years ago, I couldn't stomach paying the price for Microsoft Office. I installed OO on her computer and it took a little getting used to, but she's become quite competent at it and is happy that she has functional software that's easy to use. 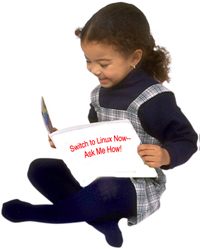 I can't quite get her to accept Linux yet, but I'm working on it. In any event, I'm glad that I stumbled onto your blog. I've had the occasional problem learning how do things in Writer and Calc that I knew how to do in Word and Excel, such as creating some fancy borders, which you can easily ad via Word via some built-in border art. Anyway, I've got OO on both my desktop and my laptop. Glad to hear that you seized the opportunity and that youre wife is happy with her laptop. OOo will really gain market share when it makes things blindingly obvious rather than just possible, but I try to make things at least easy. ;> Thanks! Our school system is switching over to OO and I'm trying to help teachers make that transition. Our teachers do a weekly newsletter and I'm not having much luck finding a good newsletter template. I'm not one for re-creating the wheel, but haven't found much on the web in the way of Writer newsletter templates. Anyone who could direct me to one, or post one, would be greatly appreciated. Try the OxygenOffice templates at extensions.openoffice.org. Also just try opening a .doc file that's set up as you want it, and see how that works. Also take a look at the right, in my Templates and Templates 2008 categories. for my psychology class i have to make baseball cards for about 30 different psychologists and i do not know how to do that in open office. can anyone help me?